Are you a road trip family? I must admit that the idea of an epic road trip is slightly seductive, but be that as it may I am still a reluctant road tripper. 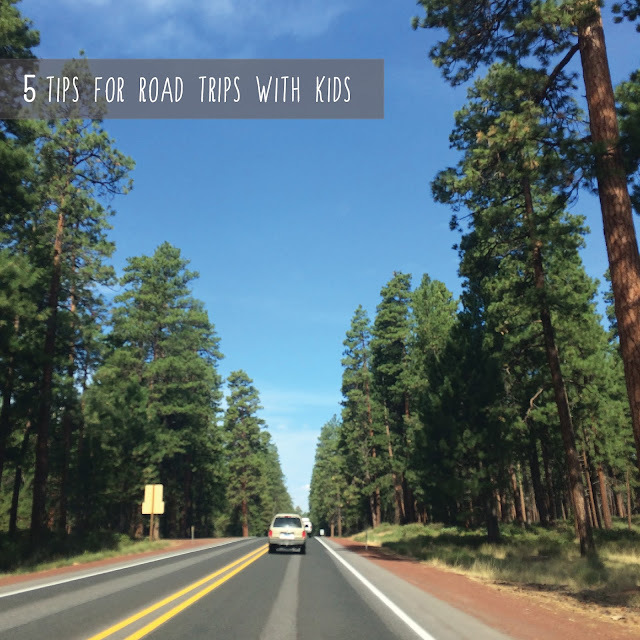 However, since road trip season officially begins this weekend we have a small road trip planned and we would be remiss in not sharing these 5 tips from Elise at 3kidsTravel that are making me feel more prepared for it! 1. Get your kids involved in travel planning. Before your trip, show your kids a map and the route you are going to take. Talk to them about what they might see on the way and where you will stop to eat, go to the bathroom, and run around. You can also talk to your kids about what they might need to pack or wear on your trip and what you will be doing when you get there. When my kids are excited and invested in our road trip it is a lot easier for them to have a good attitude and have fun along the way. 2. Pick the "right" time to travel. There is no wrong time to travel, but you want to pick the best time to travel for your kids. If your kids will sleep in the car, you might want to travel at night or during nap time. If your kids don't nap, you might want to do something active with your kids before you head out. Also, make sure to check traffic patterns, construction delays, and rush hour times so you can maximize your travel time. 3. Find activities to do other than watch TV. Don't get me wrong, we rely heavily on our DVD player in our car. But, kids can only watch so many movies. Be prepared with some car games (I Spy and the License Plate game are fun), books on tape, window clings, stickers, WaterWOW books, Legos, Boogie Boards, or anything else your kids think is fun. There are so many non-messy activities you can bring in the car, just make sure nothing you bring has really little pieces that can get lost. 4.Take turns driving (or don't) with your partner. We have found that I'm a better driver and my husband is a better navigator. I always drive on road trips and he navigates and handles the kid's many requests. I get carsick when I have to keep turning around to check on the kids and I may be a little bit of a backseat driver so this arrangement also helps us keep harmony in our marriage. Decide with your partner how you are going to break up the car duties and make sure everyone is happy with the plan. 5. Bring clean-up supplies and stay on top of cleaning your car. If you are driving your own car, make an effort to clean up every time you fill up with gas. I always bring garbage bags, paper towels, baby wipes, and towels in our car. When we stop to get gas we pick up garbage, clean up spills, and try to refresh our car. When I take just a few minutes to keep our car clean it makes everyone happier and it reduces the amount of cleaning we have to do when we get to our final destination. Sleep and safety are also key to road trips with kids. Make sure you get plenty of sleep the night before and that you've checked your car for any potential problems ahead of your drive. We just barely got back from a road trip to Yellowstone National Park and it reminded me how much fun it is to have your whole family packed into a car for a long ride. There may be tough moments, but it is really a great way to bond as a family. Safe travels! Do you have any other tried and true tips for road trips with kids? We'd love to hear them! We got these for our kids and they were awesome! They helped our 2 year old keep his snacks and toys from spilling and when on our return trip he had a stomach bug, it caught his vomit and was a breeze to wipe down. I definitely think that having cleaning supplies in the car is really important. We threw in a couple pairs of latex gloves and when we had to do emergency clean up in a sketchy part of LA we were grateful to have the gloves, wipes, and extra garbage bags right on hand! Those look fabulous! Love the idea about including some latex gloves as we have had some issues with car sickness. Luckily, we've had trash bags and wipes but gloves would have come in handy. Thanks for sharing!